Still, in general, Mr. Putin made a better case in the piece against a U.S. military strike than the American president has for it. And he did so, in a way, by getting to the left of the president, who he implies is insufficiently respectful to international bodies. Mr. Putin was candid about his primary anxiety—a spillover from Syria that could threaten Russian stability. The Syrian civil war, he both conceded and cleverly noted for a U.S. audience, is in no way “a battle for democracy.” He made no moral claims for his ally, Bashar Assad. The war, he said, is a battle between government and opposition, with the latter composed of militants and mercenaries including al Qaeda fighters and “extremists of all stripes.” He sees what is happening as a danger to his country. Some of the rebels are from the West, and some from Russia itself. He does not want them returning home with the training they’ve acquired. “This threatens us all,” he said. True enough. 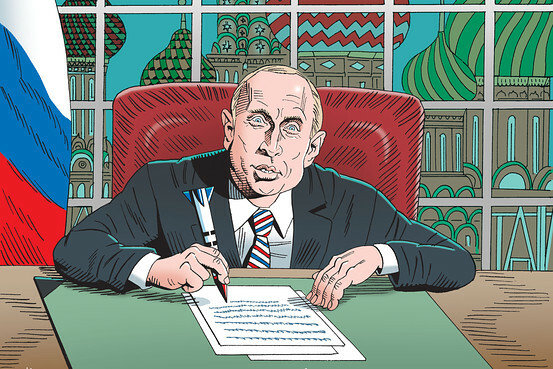 Mr. Putin’s challenge to the idea to American exceptionalism was ignorant and tone-deaf. The president had thrown in a reference to it at the end of his speech. Mr. Putin, in his essay, responded: “It is extremely dangerous to encourage people to see themselves as exceptional, whatever the motivation.” After all, he said, God made us all equal. America is not exceptional because it has long attempted to be a force for good in the world, it attempts to be a force for good because it is exceptional. It is a nation formed not by brute, grunting tribes come together over the fire to consolidate their power and expand their land base, but by people who came from many places. They coalesced around not blood lines but ideals, and they defined, delineated and won their political rights in accordance with groundbreaking Western and Enlightenment thought. That was something new in history, and quite exceptional. We fought a war to win our freedom, won it against the early odds, understood we owed much to God, and moved forward as a people attempting to be worthy of what he’d given us. We had been obliged, and had obligations. If you don’t understand this about America you don’t understand anything. I don’t know why the idea of American exceptionalism seems to grate so on Mr. Putin. Perhaps he simply misunderstands what is meant by it and takes it to be a reference to American superiority, which it is not. Perhaps it makes him think of who won the Cold War and how. Maybe the whole concept makes him think of what Russia did, almost 100 years ago now, to upend and thwart its own greatness, with a communist revolution that lasted 75 years and whose atheism, a core part of its ideology, attempted to rid his great nation of its faith, and almost succeeded. Maybe it grates on him that in his time some of the stupider Americans have crowed about American exceptionalism a bit too much—and those crowing loudest understood it least. But I suspect on some level he’s just a little envious of the greatness of America’s beginnings. The Russian Revolution almost killed Russia—they’re still recovering. The American Revolution has been animating us for more than two centuries. The irony of course is that Mr. Putin used the exceptionalism argument against Mr. Obama, who himself barely believes in the idea and no doubt threw it into his speech the way he often throws things like that in at the end: He thinks Americans like it, that the nationalist ego of the clingers demands it. But he doesn’t mean it. Asked about American exceptionalism once, he said sure he believes in it, just as the Greeks believe in Greek exceptionalism. Thank you for that rousing historical endorsement. After Mr. Putin’s comments, New Jersey’s Sen. Bob Menendez was asked for his response. “I almost wanted to vomit,” he said. This was the best thing Bob Menendez has ever said, and really did sum up U.S. reaction. A mystery of the Syrian crisis, and the Putin essay, is this. Mr. Putin obviously feels considerable disdain for the president, in spite of what he threw in at the end of his essay—that he and Mr. Obama have a personal and professional relationship marked by “growing trust.” Sure. But I keep thinking of Mr. Obama’s meeting with then-President Dmitry Medvedev in May 2012 and Mr. Obama’s famous hot-mic comment that after the election he would have “more flexibility” and hoped Mr. Putin understood that. Why didn’t Mr. Obama’s promised flexibility earn him any gratitude from Mr. Putin? Why didn’t it earn him Mr. Putin’s discretion, especially at a difficult moment like this? One thing is certain. Mr. Putin’s essay was not Nikita Krushchev slamming his shoe on the desk at the U.N. and saying, “We will bury you!” Those were bad days. We’ll see, in retrospect, what these days are. It’s not a cold war between the U.S. and Russia, and it’s not a hot one, but there’s a new chill in the air, isn’t there?